Mookie Betts went 5 for 12 this week, which included a 1 for 3 performance in the AFL Championship Game on Saturday. Betts hit an RBI single in the bottom of the eighth that stretched Surprise's lead to two. Betts finished the AFL with a .271/.368/.373 line, walking nine times and striking out 10 times in 59 at-bats. While he did not show much power in Arizona, Garin Cecchini still posted a .434 on-base percentage, which is right in line with the .443 on-base percentage he had in 129 games between Salem and Portland this season. He went 4 for 11 this week and went 0 for 3 with a walk in the title game. While Betts and Cecchini were the highest rated prospects from the Red Sox in the AFL, Travis Shaw was the top performer. His numbers dropped this week as he went 3 for 11 with only one extra-base hit, but his final line was still an eye-popping .361/.452/.705 with five home runs in 61 at-bats. Miguel Pena had a forgettable outing on Wednesday, allowing six runs on eight hits in four innings. He was done in by the long ball, as Peoria got to him for three home runs. He had an up-and-down fall, finishing with a 4.55 ERA and a 1.37 WHIP in 27 2/3 innings. Noe Ramirez (pictured) was the lone Red Sox pitcher to get into the championship game on Saturday, striking out the side in a scoreless seventh inning. 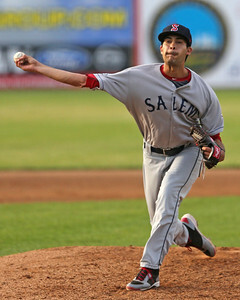 Ramirez was impressive all fall, posting a 1.93 ERA and 0.86 WHIP in 14 innings of relief. Saving his best performance for last, Derrik Gibson went 2 for 4 with a home run on Wednesday. Gibson hit .125/.286/.225 in limited playing time for Surprise. Allen Webster failed to get out of the first inning in his only start this week, allowing two runs on four hits with two walks while only recording two outs. He has now allowed 10 runs in 12 2/3 innings with the Leones del Escogido. Chris Martin allowed an unearned run in his one inning on Wednesday, and he has still yet to allow an earned run in eight innings. Bryce Brentz, Dan Butler, JC Linares and Keury De La Cruz all had limited success this week. Brentz went 0 for 4 with three strikeouts, Butler and Linares each went 1 for 7, and De La Cruz went 1 for 5. Jesus Loya had a strong week, going 7 for 17 with a walk and three doubles. No Red Sox appeared in a game this week. In his second appearance, Jeremy Kehrt managed to keep his ERA at 0, but he did allow three unearned runs in five innings of work. Henry Ramos had his best week of the fall, going 7 for 23 with a double, a home run, and three walks. Jonathan Aro pitched three perfect innings of relief to pick up his first win on Monday. He has allowed only one run in 14 innings for Boston. Victor Ramirez has also been pitching well for Boston, as his ERA sits at 1.80 after 20 innings. Jose Vinicio led the offense this week, and he now has a .369/.417/.523 line. David Sopilka went 3 for 3 with a home run and a walk on Tuesday, and is now batting .280/.424/.560.